After 4 years at Adlards he then headed back to London to work for Tom Aikens at Pied A Terre, incidentally Tom was the youngest chef to achieve 2 Michelin stars at 26. Following a couple of years in London Aiden then moved on to Dublin and worked in The Commons Restaurant for 4 years, and they were was awarded a Michelin star after 8 months. 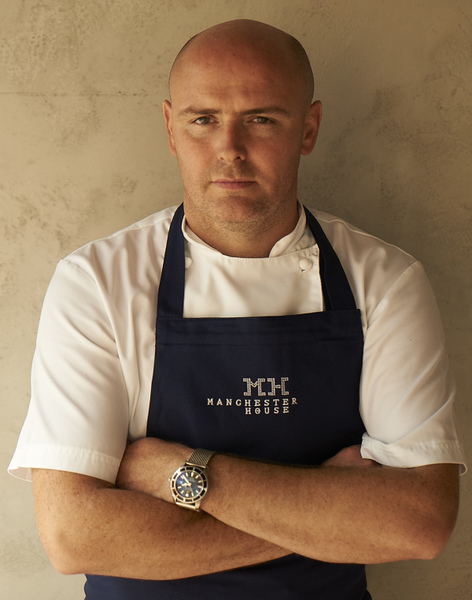 In 2018 Aiden joined forces with the renowned hospitality Svengalis D&D and opened their first restaurant in Manchester – 20 STORIES. Since opening in March the fantastic dining room in the sky has been a phenomenal success, and has enjoyed a wealth of praise and fantastic reviews – including Grace Den’s Guardian summary – ‘this will no doubt be one of my favourite meals of the year’. As Executive chef, Aiden will work alongside D&D in the north, building on their already enviable reputation. His culinary expertise and accolades means that Aiden is also a big draw at many events and festivals throughout the UK. Namely the foodies festival circuit Blue Dot Festival and the hugely successful Festival Number 6. Aiden has always been a huge supporter or national and local charities, and in recent years he has helped to raise thousands for numerous charitable organizations, including BrainWave, Christies & Hospitality Action. Aiden’s first book – Made In Great Britain – was published in 2008 to much critical acclaim. His second book, based on his creations for Manchester House is currently in development, and will be published next year.